The National Shorthorn Lassies serves as the women’s auxiliary of the American Shorthorn Association. Officially organized in 1956, Lassies encourage and extend the influence of Shorthorn Breeding, promote the interest of its membership, stimulate greater activity, and cultivate closer relationships. 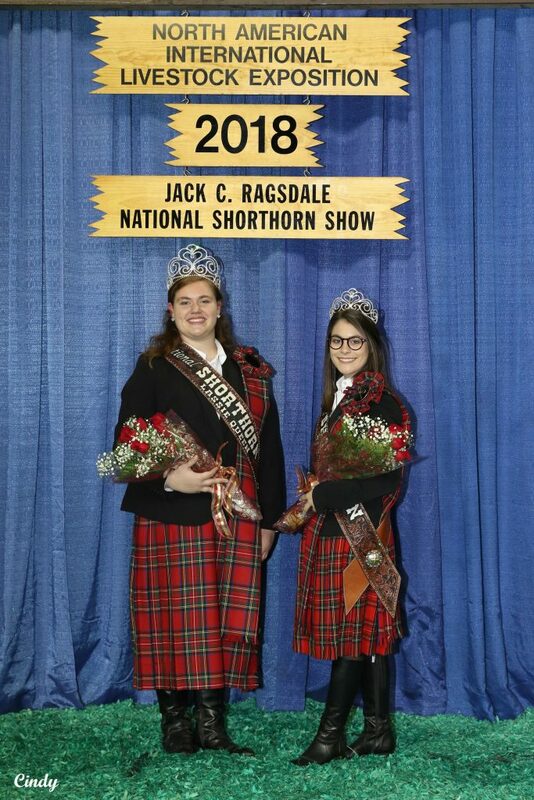 The Lassies also arrange exhibits at national shows, present awards, publicize the breed provide reception committees, and conduct activities that pertain to the National Queen contest and other promotional activities. The National Shorthorn Lassies, a women’s auxiliary of the American Shorthorn Association, was officially organized in 1956 at the Chicago International Livestock Show in the Harvest Room of the Stock Yards Inn. W. Henry Dilatush of Memphis, Tenn., was the “father” of the Lassie movement. As a member of the ASA Board of Directors, he presented a resolution at the 1955 annual meeting of the ASA recommending the formation of a women’s auxiliary. He suggested the name Shorthorn Lassies. Mr. Dilatush persuaded Mrs. Henry Baum of West Lebanon, Ind., to assume the responsibility of the organization. Dilatush gave the Lassies $100 check to help with establish the organization, and through letters, he persuaded others to give financial help as well. Mrs. Baum then served as the first National Shorthorn Lassie President. The 1956 International marked the original appearance of Lassie Queens at Chicago. Twelve young ladies were present. Ann Bullock of Missouri was the first National Lassie Queen that year. Shorthorn Lassie Queens are repeatedly asked, “Just what is the meaning of what you are wearing?” The answer lies in our breed’s heritage. Since Shorthorn beef cattle originated in the British Isles and many of our valuable beef improvements were made through cattle imported directly from Scotland, the national Scottish costume was selected. It is interesting to note that the Lassie Queen’s tartan is known as the Royal Stuart. The royal tartan, as adopted by the House of Stuart, is the official tartan for Britain’s Royal Family. There are many common misconceptions about the National Scottish dress. The KILT is officially described as a type of short pleated petticoat worn in the Highlands of Scotland. The TARTAN is the cloth itself. Usually woolen, it is either checkered or cross-barred with narrow bands of various colors. It is also worn in the Scottish Highlands. The PLAID is actually a garment worn like a shawl wrapped around the body and fastened at the left shoulder. It is worn by both sexes in Scotland in place of a cloak.